Utah Highlights From The Simplot Games! The Simplot Games is easily the biggest meet Utah has on its Indoor Calender. High School athletes from the beehive state have had this race circled on their calender since the new year and this meet didn't disapoint for them. We saw a lot of Utah athletes win gold, take home PRs, and qualify for New Balance Nationals Indoors. It was one of Utah's best showings at Pocatello. Biggest Highlight on the girls side was the sophomore from Woods Cross, Carlee Hansen. Hansen has gone undefeated this indoor season, (excluding Simplot pre-lims) and hasn't shown signs of letting up. 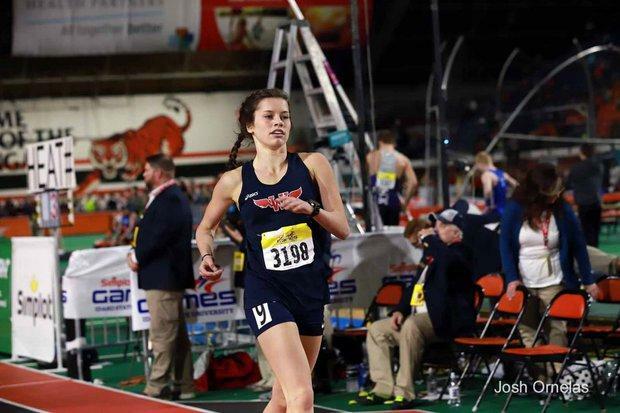 Carlee ranks as the top of her class in the nation for 1600 meters and 4th for 800 meters. She has accepted an invite to compete at New Balance Nationals. The only girl she trails in this country for 1600m is defending NXN Champion Katelyn Tuohy. Not some bad company to be in as a sophomore. Girls Relay: We also saw the girls from Gold Medal Athletics take the win in the SMR after the top team was disqualified for an early lane violation. GMA still performed at an elite level running 4:12.95. The team was comprised of Adi Nielson from Delta, Amy Ballard of Lehi, Emma Reeves of Orem, and anchoring was Jasie York of Cedar. Also the Lone Peak girls set a new State best in the 4x200m going 1:48.12. Girls Sprints: In the girls 60m we saw Cassidy Henderson set the State leading time at 7.82 where she finished 12th in the finals. Brittany Cardall went 25.72 for 200m and Adi Nielson dropped her season best in the 400m to 58.24. Girls Field: Hannah Stetler of Bingham vaulted 11-11.75 for a new season best, Make Taufa from Herriman threw 39-5.25 for a new season best in the Shot Put, and Ashlee Mcune for Sky View threw 29-7.5 in the weight throw for a new season best.